Whether it’s a rare book printing found at long last or piece of ephemera found in an archival collection by chance, those who visit the University of Houston Special Collections almost always find something they cannot wait to share with others. 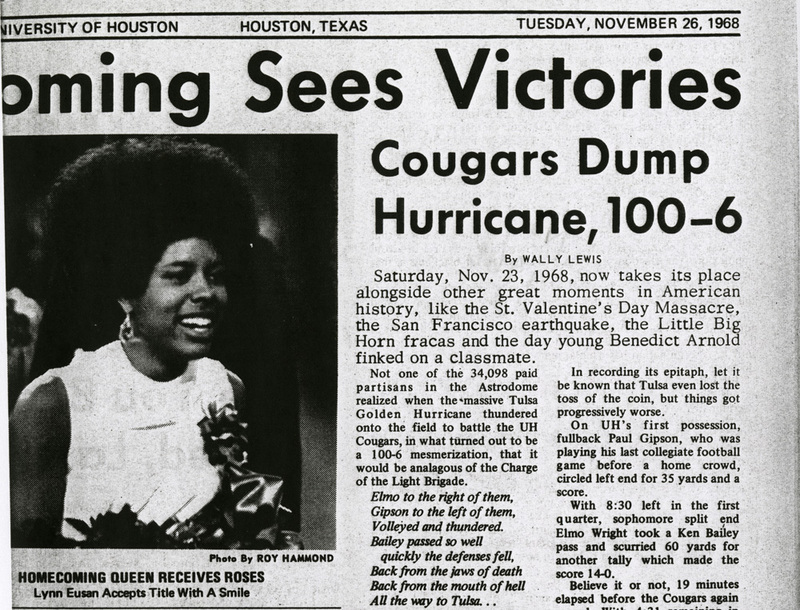 Here we celebrate what makes the University of Houston Special Collections so special–our Favorite Things. Today Julie Grob, Coordinator for Instruction, offers us one of her favorites. 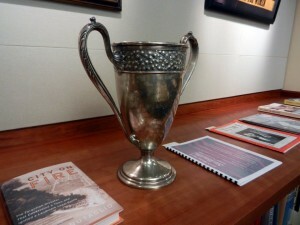 I nominate the silver loving cup from the Alvin Romansky Papers, which currently sits in the reading room. It was donated to his uncle Thomas Flaxman, who was the general manager of No-Tsu-Oh (Houston’s version of Mardi Gras). The inscription on the loving cup also mentions Deep Water and the year 1914, which is a reference to the development of Houston’s port. 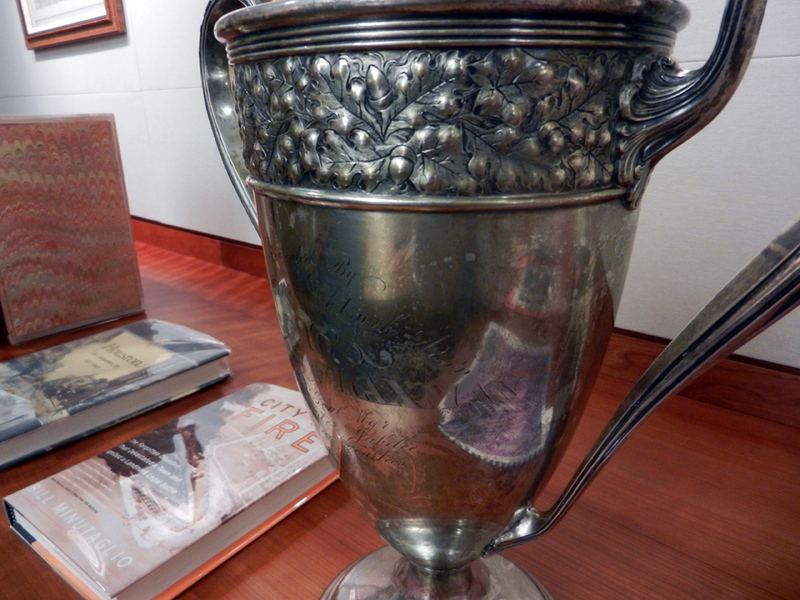 In addition to being significant to the history of the city, the loving cup is elegant and silver. This loving cup is on display alongside a number of other photographs and artifacts from our collections, and available for viewing during our normal reading room hours. Or, those interested in learning more about Alvin Romansky and the critical role he played alongside others to grow and support the contemporary arts in Houston, should be sure to spend some time with the Alvin Romansky Papers. 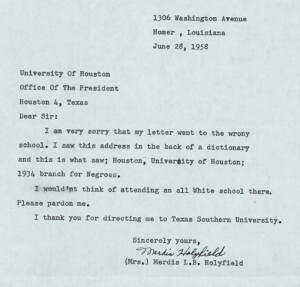 Thanks for letting us share and, of course, if you have your own “favorite thing” about the University of Houston Special Collections, we’d love to hear about it! 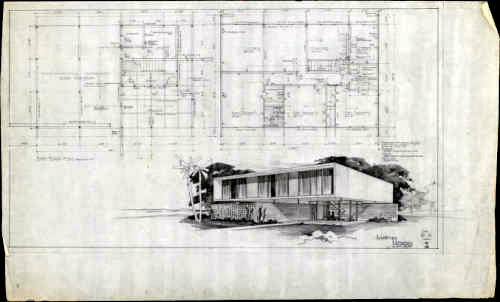 The Lucian T. Hood Architectural Papers have joined the UH Library’s Digital Library collections. 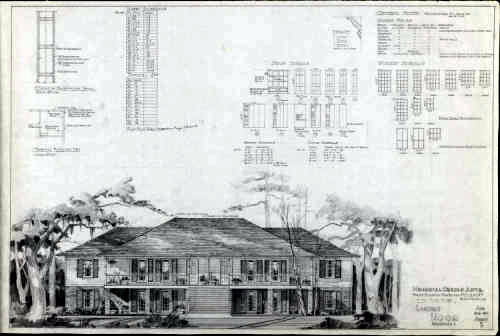 Lucian Hood (1916 – 2001) was an important Houston architect who made his reputation as a house designer for the rich and famous. During the 1970s and 1980s he had one of the largest and best-known residential design practices in the city. 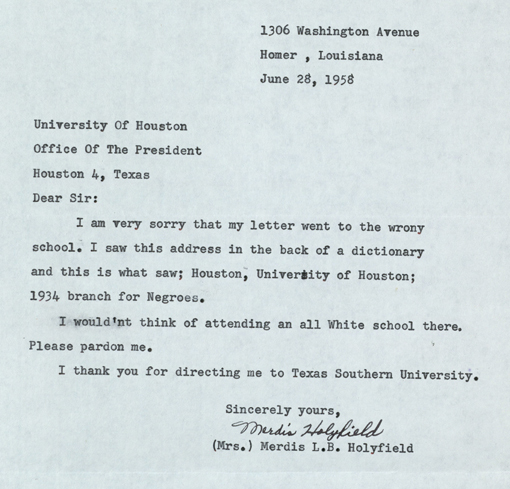 Hood earned his architecture degree from the University of Houston in 1952. He studied under such prominent architects as Donald Barthelme, Sr. and Howard Barnstone. 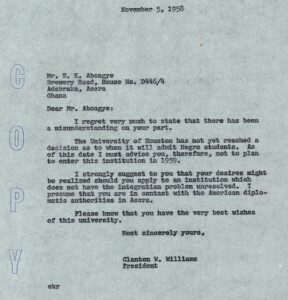 Among his classmates were Burdette Keeland, Jr. (UH 1950) and Kenneth E. Bentsen (UH 1952), both of whom went on to distinguished architectural careers. The Barthelme, Keeland, and Bentsen papers are among the important Architecture and Planning collections held by the library’s Special Collections Department. Early in his career Hood designed both commercial and residential buildings but by the late 1960s had switched to residential architecture exclusively. His work is well represented in the affluent River Oaks, Memorial, and Tanglewood neighborhoods of Houston. His houses were usually traditional in style and were notable for his attention to the many traditional details that brought the designs to life. 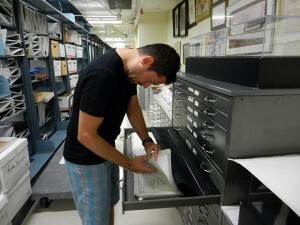 The Lucian T. Hood Architectural Papers are the largest of Special Collections’ Architecture and Planning collections. Covering the four decades from 1961 to 2001, the collection encompasses approximately 900 projects. Unfortunately, most of Hood’s early work from the 1950s was lost before the library acquired the materials. 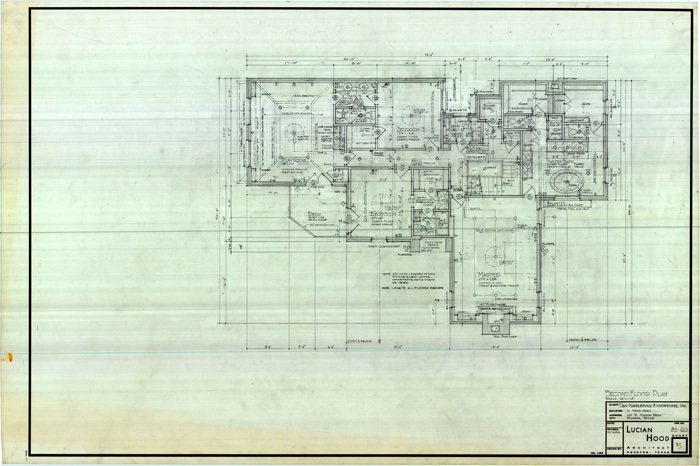 Special Collections often receives requests for copies of the Hood drawings—usually from patrons who own a Lucian Hood-designed house and want copies of the architect’s original plans. The department welcomes the chance to make the Hood drawings accessible online, but because of the enormous size of the collection, only a small part has been digitized. The Digital Library has the projects from the 1960s, but more may be added in the future. Until then, patrons seeking copies from the Lucian T. Hood Architectural Papers should contact the Special Collections Department for assistance. Another on the list of recently published digital collections–Photographs from the Leonor Villegas de Magnón Papers. Previously, we have written about the larger Leonor Villegas de Magnón Papers and how pleased we are that our partnership with Arte Público has made available for study the papers of such a trailblazing, radical Latina. The recent publication of this digital collection, featuring select photographs, will provide prospective researchers a new window into a figure much obscured from our predominant Texana narrative. Born in Nuevo Laredo, Mexico in 1876, Leonor Villegas de Magnón would lead a life that, for a woman of her time, place, and disposition, found her pushing headlong into a fierce, at times unfriendly current of history in the American Southwest. 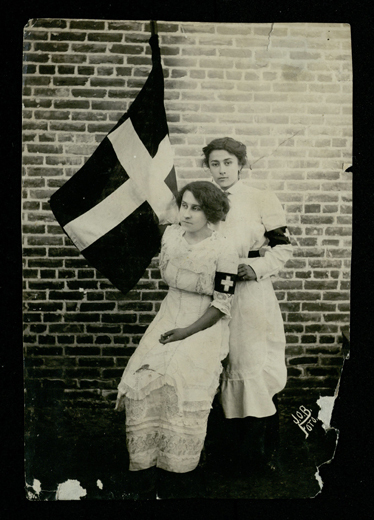 Educated in San Antonio and Austin, Texas, Magnón would take up permanent residence in Laredo and is remembered today as an educator, journalist, activist, and the founder of La Cruz Blanca (The White Cross) during the Mexican Revolution in 1913 (following in the tradition of other voluntary relief organizations being established to nurse the wounded of war). Her remarkable life is documented in her autobiography, La Rebelde (the Lady Rebel). Included in this new digital collection are portraits, landscapes, and photographs showcasing her work in the Mexican Revolution as well as candid photographs featuring her family and friends. Notable figures like Porfirio Díaz, Jovita Idar, and Pancho Villa, can be found throughout the collection. We hope you enjoy this new digital collection of photographs and invite you to visit the Special Collections Reading Room should you wish to further explore the Leonor Villegas de Magnón Papers. Today we have a goodbye post from Bryan Bishop ’14, the department’s first Instruction Support Student Worker. During his year in the position, he prepared rare materials for class visits, maintained the Evans Room (our classroom and function space), input student learning assessment data, digitized materials requested by patrons, and created descriptive metadata for a collection of World War II photographs. A graduate of the UH Honors College in History and Political Science, Bryan is heading to Fonville Middle School in H.I.S.D. to teach U.S. History for the 2014-15 school year. He has also been accepted into the John W. Draper Master’s Program in Humanities and Social Thought at NYU with a deferred start date. All of us will miss Bryan’s intellectual curiousity, “can do” attitude, and sense of humor. Heeeeeere’s Bryan! When I happened upon the Instruction Support position available in Special Collections last August, I had no idea what “instruction support” was, or that it would be the best job I ever had. As an older student worker I had had a few jobs prior to arriving at UH. But those jobs levied tremendous pressure, rarely yielding pleasure. This job was different. All that would be asked of me was to show up ready to work, complete thoroughly what was asked of me, and display passion for my projects, most of which involved research relating to my studies and interests: humanities and social sciences. Strange as it may sound, in 20 years of working this was the first time I was unconditionally happy. Performing tasks around the department was a riot. True, I too have never associated riots with libraries. If anything, life surrounding a library is the complete opposite, serene. So how was working in Special Collections a riot? It was a riot in the sense of how I felt while and after performing my duties; that everything I did was significant for our university community and a team I hold in the highest regard—my co-workers, my friends. This, admittedly, is a peculiar illustration; however, I find that the more idiosyncratic a description is, the more unique, and in this case, special, the experience was. I could utilize more space than the Interwebs have allotted to express my gratitude vis-à-vis the projects on which I was allowed to work. Ergo, I must devote my closing thoughts to my peers and managers in the department.